■ Thoracoscopic transdiaphragmatic technique is a novel minimally invasive procedure. 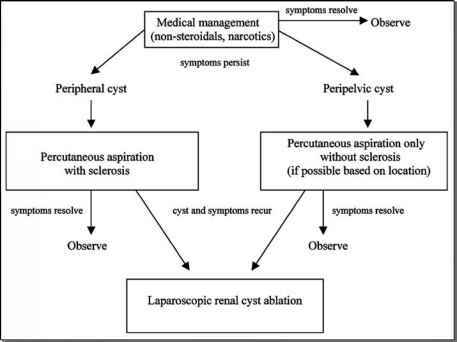 ■ In patients with a surgically virgin abdomen, laparoscopic adrenalectomy done with the technically simpler transperitoneal or retroperitoneal approaches is recommended and preferred. ■ A thoracoscopic transdiaphragmatic approach through the virgin thoracic cavity may be reasonable in the rare patient with surgical adrenal pathology and prior major abdominal surgery precluding transperitoneal and retroperitoneal laparoscopy. ■ Necessary requirements for thoracoscopic transdiaphragmatic surgery include anatomical familiarity and considerable experience with thoracoscopic and transabdominal laparoscopy. ■ In the future, thoracoscopic and transabdominal laparoscopy could be combined to provide a minimally invasive alternative to open surgical thoracoabdominal incision in patients with larger adrenal (25) or upper pole renal masses.